The Walt Disney Company has presented an extensive overview of its comprehensive direct-to-consumer strategy, unveiling a first look at the Disney+ offering, which will launch in the US on November 12th, 2019 at $6.99 (€6.20) per month, with plans to launch globally over the next two years. The service will offer fans of all ages a new way to experience what Disney calls the “unparalleled” content from the Company’s iconic entertainment brands, including Disney, Pixar, Marvel, Star Wars, and National Geographic, and will be available on connected TV and mobile devices. These titles will join previously announced scripted originals including The Mandalorian, the world’s first scripted live-action Star Wars series, the exclusive new season of Star Wars: The Clone Wars, High School Musical: The Musical: The Series, the untitled Cassian Andor series starring Diego Luna and Alan Tudyk, the Marvel Studios series Loki starring Tom Hiddleston, Monsters at Work, Diary of a Female President, and live-action films Lady and the Tramp, Noelle, Togo, Timmy Failure and Stargirl. Nonfiction series also announced earlier include Be Our Chef, Cinema Relics: Iconic Art of the Movies (wt), Earthkeepers (wt), Encore!, the untitled Walt Disney Imagineering documentary series, Marvel’s 616, Marvel’s Hero Project, (Re)Connect, Rogue Trip, and Shop Class (wt). Additionally, Disney+ announced that all 30 seasons of The Simpsons will be available on the service on day one. In year one, audiences will also have access to family-friendly Fox titles such as The Sound of Music, The Princess Bride, and Malcolm in the Middle. This content will join a collection of more than 7,500 television episodes and 500 films including blockbuster hits from 2019 and beyond. Designed to super-serve the most ardent fans, Disney+ will provide subscribers with a feature-rich product experience that makes it easy to navigate, discover, and watch their favourite programming with immersive brand tiles and dedicated pages for Disney, Pixar, Marvel, Star Wars, and National Geographic. Subscribers will have the ability to create custom profiles with each receiving personalised experiences curated to their unique tastes based on past behaviours and preferred content. Following its US debut, Disney+ will rapidly expand globally, with plans to be in nearly all major regions of the world within the next two years. 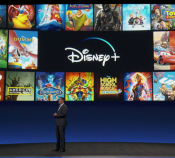 According to analyst firm Digital TV Research, the company expects to reach 60-90 million Disney+ subscribers by 2024, with the US contributing a third. Digital TV Research believes that this is achievable. In fact, Digital TV Research forecasts 75 million subscribers by 2024 – right in the middle of Disney’s estimates. The US will remain the largest market by some distance, adding an average of 5 million subscribers a year to take its total to 25 million by 2024. Some way behind, the UK will provide 5.5 million subscribers, followed by Brazil and Canada. These four countries will account for half the total subscribers.